The Finnish/Swedish Antero was born and raised in Stockholm, Sweden, and he is currently based in Oslo, Norway, where he studied at Oslo National Academy of the Arts and graduated in 2012. Before this Bachelordegree, Antero attended Lunds Dance & Musical Gymnasium. 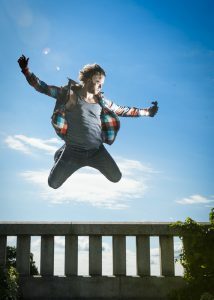 In addition to dance he since 2005 trained Parkour/Free-running. He founded the parkour group “TiP” in 2006 which is now designing parkour parks around Sweden, hosting trainings/workshops and performing on various events/movies/commercials. Antero has been dancing in musicals like “Cats the musical” in Malmö and “Sweet Charity” in Lund, Sweden. He has also been working with 4 1/2 Film/Nordic Film, Curry Film, NRK and SVT. And been involved/performing in productions with Ina Christel Johannesen/ZeroVisibilityCorp., Hallgrim Hansegård/Frikar, Flukt Productions, Opera Trønderlag, Peer Gynt As, Stian Danielsen, Andre Danielsen, Kari Hoaas productions, Christopher Arouni/Arouni Dance, Masja Abrahamsen/ink production, 37th Floor/Tine Aspaas, Anne Kathrine Fallmyr, Camilla Tellefsen, Yossi Berg and Oded Graf and Baerum Kulturhus. In 2013 he started “Hein Creations”, which has given him the opportunity to work with Dansenshus, Danseinformasjonen, Rom for Dans, Oslo National Academy of the Arts, Oslo Danse Ensemble, Seanse and artists like Hege Haagenrud, Mia Habib, Jo Strømgren, Fredrik “Benke” Rydman, Ole Martin Meland, Francesco Scavetta, Tine Erica Aspaas, Camilla Tellefsen, Janne-Camilla Lyster, Terje Tjøme Mossige, Kari Hoaas, Masja Abrahamsen, Gry Bech-Hanssen, Karoline Rising Næss, Sigurd Christian Dahle Uberg, Erlend Auestad Danielsen, Hanne Elisabeth Svenning, Tuva Selmer-Olsen, Dag Rune Sjøli, Jack Lorenzen, Anne Lise Pettersen Rønne, Daniel Rodrigo, Siri & Snelle Produksjoner, Mai dans, Denaive, Catherine Michelet and Zero Visibility Corp.